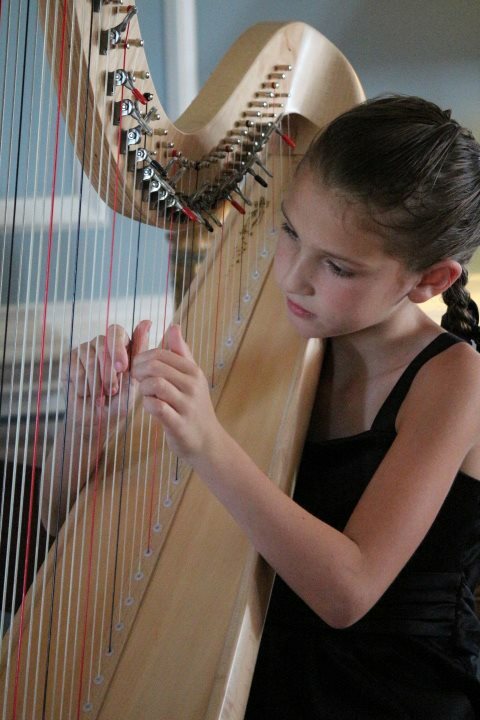 Adams International School is pleased to host classical harp and piano lessons with instructor Alicia Romeo Grebe. Alicia Romeo Grebe performs as a symphony musician, chamber musician and recitalist. She currently performs as harpist with the Richmond Symphony Orchestra. Through a grant with the Virginia Commission for the Arts, she has toured not only the rural communities of Virginia but performed in great concert halls such as the Kennedy Center in Washington, D.C., the American Consulate in Florence, Italy and Carnegie Hall. Alicia earned both her bachelor and master’s degrees with high honors from Indiana University where she studied with Susann McDonald. A fervent advocate of musical education, Alicia served as instructor of harp at The College of William & Mary and at Virginia Commonwealth University. She also has taught private harp and piano students of all ages for more than 15 years. An avid lover of the outdoors, Alicia was thrilled to have spent summers in both the American and Canadian Rockies at the summer music festivals of Aspen and Banff where she was able to combine her loves of both music and the outdoors. Alicia and her husband live in Goochland where they are raising two young children. For information please email Alicia Romeo Grebe.